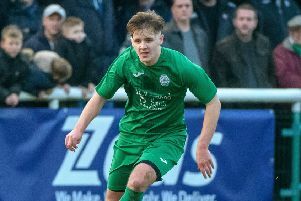 A last minute Tom Coles strike gave Biggleswade FC all three points at Colney Heath on Saturday and ended their opponents’ unbeaten start to the league season. The Magpies took the lead on 25 minutes and it was pretty desperate from an FC point of view. A speculative looking switched pass towards Jack Woods caught Dave Lenton out of position. Woods’ right footed shot looked tame but it still had enough on it to sneak past Beall at the near post. FC finally came to life on 32 minutes when a lovely move between Coles, Alex Marsh and Lee Northfield saw the latter dance past a couple of challenges before driving into the corner of the six-yard box. A scramble ensued and somehow Colney scrambled it clear. In the second half FC started to force a number of set-pieces. It was from one of these that Lee Northfield, with the aid of a deflection, hauled the visitors level on 58 minutes. George Riley rolled the ball to the edge of the box and Northfield got a good strike on it. The deflection on the way through wrong footed Colney keeper Charlie May and went into the bottom left hand corner. Encounters between two closely matched teams can often be decided on fine margins and that proved to be the case here. Colney had a great chance with nine minutes left. The home forward drove in on goal but Beall stayed big and made an excellent stop. What Colney couldn’t do at one end, Coles delivered at the other. FC’s leading marksman chased down what looked a lost cause. The home full back looked to have snuffed out the danger. However, the attempted header back to Charlie May didn’t have enough on it and Coles’ desire to beat the keeper to it was rewarded, sliding the ball home from outside the corner of the six-yard box.